W. Cleon Skousen was a federal law enforcement officer, an author, philosopher, fighter of communism and organized crime, religious leader, police chief and a lightning rod for the political right. But whatever his role, his friends and foes alike agree that he was a man of unwavering principle who fought fiercely for his beliefs, making deeply committed followers and equally strident enemies along the way. "He was an enormously forceful debater. He was deeply committed to a conservative, right-wing approach to American politics and he was certainly able to throw a blanket of doubt around the U.N., around aspects of the welfare state and around a too-powerful national government," said former University of Utah political science professor J.D. Williams, a philosophical adversary in the 1950s and '60s who had several well-publicized debates with Skousen over the proper interpretation of the U.S. Constitution. "He spoke well and for his supporters he wore a bright mantle of conservative thought at its very best," Williams said of Skousen, who died Monday at age 92. Skousen served 16 years in the FBI as a special agent, assistant to director J. Edgar Hoover and director of communications. He also was editor of the nation's leading police magazine, Law and Order. A prolific writer, he authored 46 books, including the best sellers The Naked Communist, The Naked Capitalist, So You Want to Raise a Boy?, The Making of America, The Five Thousand Year Leap and Fantastic Victory. His books on religion, such as The First 2000 Years, Prophecy and Modern Times, Isaiah Speaks to Modern Times, Treasures From the Book of Mormon and Days of the Living Christ reached millions of readers in the Christian and Jewish communities and won friends in the Israeli Knesset. Paul Skousen, the seventh of W. Cleon Skousen's eight children, said his fondest memory of his father was his constant writing. "I'd go to bed with the sound of my father typing and I would wake up with the sound of his typewriter," said Skousen, of South Jordan. A popular speaker, Skousen sometimes gave hundreds of lectures in a year throughout the United States and abroad, and he founded two influential think tanks of conservatism: The Freemen Institute and The National Center for Constitutional Studies. "He was always a kindly, gentle person," said Utah Republican State Chairman Joe Cannon. "Some think of very conservative people as harsh and vindictive. I never heard him be harsh and vindictive toward anybody, including communists in the Cold War days." Skousen became chief of the Salt Lake City Police Department in the 1950s. Paul Skousen remembers when coming home from church his father would flash the police car lights and sound the siren as they pulled into the garage. Police Chief Skousen became the center of controversy in 1961 when a struggle over authority with then-Mayor J. Bracken Lee led to his dismissal on a 3-2 vote of the City Commission. "My only regret is having to abandon the force of outstanding officers who have supported me for 3 1/2 years to build this department, which is finally gaining national recognition," Skousen said upon his departure. 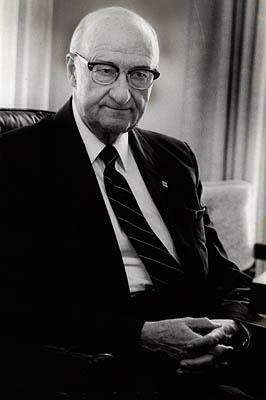 Skousen later served as alumni director of Brigham Young University and taught religious studies there for 16 years. Skousen was born in Raymond, Alberta, Canada, Jan. 20, 1913. He served a two-year mission in England for the LDS Church and later earned his law degree at George Washington University. He is survived by his wife of 69 years, Jewel Skousen, and seven of their eight children, as well as 50 grandchildren and 69 great-grandchildren. Tribune reporter Mark Eddington contributed to this story.